I have decided that summer is the best time for rotisserie chicken, because summer is when you don't want to roast your own chicken and I can eat chicken breast on salad; otherwise it's too dry and I prefer dark meat. So in summer I get rotisserie chicken, snack on the legs and thighs, use the breast in green salads, and freeze the rest to make chicken soup in the fall. This is best with fresh strawberries, strawberries that have been sitting in the refrigerator for a week start to taste funky. Fresh strawberries, though, are amazing in salad. I am showing salad mix for variety, and it does taste good. But romaine keeps better, so IRL I usually make my salads with romaine. Rinse and drain the beans. Whisk the vinegar with the olive oil, and marinate the beans in the vinaigrette. If you made extra marinated beans when you made quinoa salad, you can use whatever you have and just take them out of the fridge. Slice or shred the chicken breast, I use half a breast per salad i.e., if you count two breasts per chicken. Halve, pit, peel, and dice the avocado. 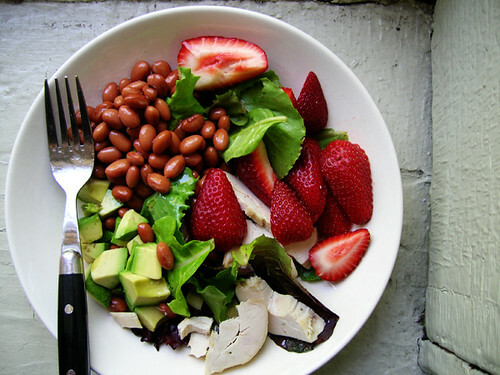 Make a bed of avocado and salad mix, then top with chicken, marinated beans, and strawberries.